Martha Meredith’s interest in psychology stems back to high school and her love for having conversations with people about their feelings. As someone who puts a lot of weight onto self-awareness and self-growth, it seemed like a natural path. Since studying psychology at Queen’s University in Ontario, she learned a lot about other people as well as herself. She wanted to focus on the actual understanding of how people think and better grasp the concept of the human condition and human nature and which parts are biological or societal. Although she didn’t focus on psychology after college, she brought everything she learned over into her other passion: music. 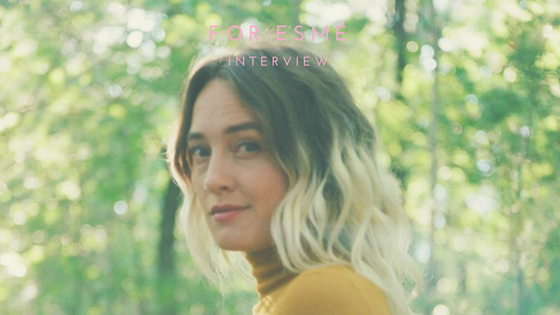 Under the moniker For Esmé, Meredith’s songwriting had her delving into topics that relate back to psychology and ultimately discovering something new about herself with each song she wrote. In being able to recognize verbal and non-verbal aspect of her studies, she began to write about her experiences and her feelings in a way that speaks beyond a stereotypical song. Righteous Woman didn’t intentionally start as a concept album. The songs started as topics Meredith wanted to address – “To Love” is about missing someone but also recognizing the feeling of empowerment while “To Hate” is about exploring the realness of the world and wanting to be the antidote to the hate but not knowing how. She walks through topics of feeling pressurized into fitting certain molds on “I Never Learn”, the misogyny in getting cat called in “Didn’t Ask” and feeling like discussions that become too real are off limits in “Small Talk”. Since she was really digging into themes that she found were more difficult for people, including her, to talk about openly, it was equal parts enjoyable and difficult to create. A central theme that made its way throughout the album is saying what should or could be said in the moment but not having the guts to say it. The more she found the guts to say it out loud, the more she wanted to show others that it can be done. With the release of Righteous Woman, For Esmé adds to the conversations of equal rights, loving yourself and having the guts to say anything. The album is meant to spark conversations and remove stereotypes of what can and can’t be talked about. Most important, it’s a powerful work of art.